It is unfortunate that Fanny Mendelssohn is best known for being the older sister of Felix, rather than for the fact that she was an extraordinary pianist and a highly talented composer in her own right. We performed her Piano Trio in D minor at our concert in Nailsworth on the afternoon of Sunday 18th February (alongside a work by another great woman composer, Lili Boulanger). Fanny Cäcilie Mendelssohn was born on 14 November 1805, the first child of a cultured Jewish family, although she and her siblings were brought up as Lutherans due to the family’s concerns about the anti-Semitism in Germany at the time. In 1809, the year her brother Felix was born, the family moved from Hamburg to Berlin. Fanny was first taught the piano by her mother, and then studied with Ludwig Berger, and in 1816, aged 11, went to Paris to study with Marie Bigot. Later she was taught composition by Carl Friedrich Zelter, who was an early champion of J.S. Bach – a strong influence on both of the Mendelssohns. Her first composition was a song for her father’s birthday, written when she was 14. The following year she enrolled at the newly opened Berlin Sing-Akademie, and over the next few years wrote a large number of songs and piano pieces. In 1829, aged 23, she married the painter Wilhelm Hensel, and their only child, Sebastian, was born the following year. 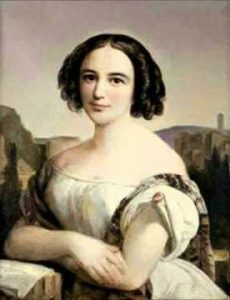 Wilhelm was supportive of Fanny’s musical activities, which in the 1830s included regular Sunday ‘salon’ events at their home, for which she created most of her compositions and where she performed on the piano and conducted. These were prestigious events in the Berlin musical calendar, and the best musicians came both to listen and perform, including Clara Schumann, Franz Liszt, and Niccolo Paganini. In 1839 the Hensel family visited Italy. In Rome, Fanny gained a young admirer – Charles Gounod, thirteen years her junior – who became fixated on her and later described her as an important influence on his musical career. Fanny was always very close to her brother Felix. As children they often performed together (both earning much praise), they challenged and stimulated each other intellectually, and they shared ideas and advice on each other’s compositions. Although Felix discouraged Fanny from getting involved in the world of publishing, several of her songs were published under her brother’s name – three in each of his op.8 and op.9 sets. This led to an embarrassing moment when Queen Victoria, receiving Felix at Buckingham Palace, expressed her intention of singing her favourite of his songs, which he had to admit was actually one of Fanny’s! A piano sonata, long thought to be by Felix, was only recently reattributed to Fanny as her ‘Easter Sonata’. Its UK premiere was given on International Women’s Day in 2017. Fanny wrote around 500 works – mainly songs and piano pieces, plus some chamber music and a handful of larger scale compositions including an orchestral Overture and some dramatic and choral works. Despite Felix’s discouragement, Fanny eventually had a few works published in her lifetime, and several more were published posthumously at Felix’s instigation. However even today much of her music remains only as manuscripts, a lot of it in private collections. The Piano Trio was completed in 1847 for her sister Rebecka’s birthday. Within a month of the premiere, Fanny suffered a stroke during rehearsals for one of Felix’s oratorios, and died, aged 41. Felix died of the same cause just six months later. The Trio was published posthumously in 1850 as op.11, and is now one of her most frequently performed works. The opening Allegro molto vivace begins with a restless piano accompaniment, over a yearning melody in the strings. The gorgeous second movement is romantic and introspective, and leads in to the third movement Allegretto which is a charming ‘Song Without Words’ (a trademark of both Fanny and Felix). The theme of the final Allegro moderato has a sad feel, but is lightened by interesting cross rhythms and a brighter second theme. This is a beautifully crafted Romantic piano trio with lots of fresh ideas, by a composer with all of the talent and invention, if not the opportunities and ambition, of her more famous younger brother.